This silver ring is all highly polished. 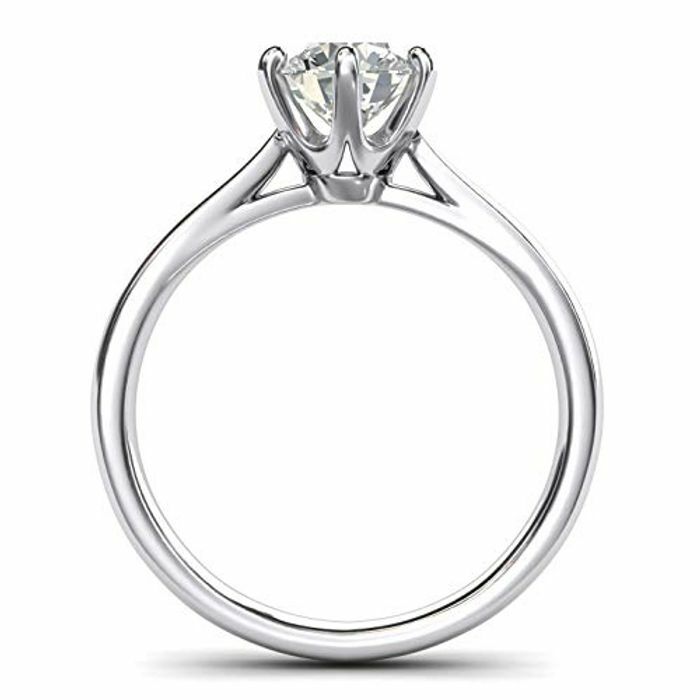 It is 6-prongs set with one 8.0mm solitaire brilliant round simulated diamond same diameter as 2.0ctw diamond. The stone is AAAAA quality, reflecting the sparkle same as diamonds do, which is very nice and attractive, making the ring look like real diamond ring. 8.0mm wide, 7.5mm high, and 1.6mm thick at the bottom. Solid, strong and high quality for lifetime wearing, with a luxurious feel. Great ring for women or girls! Great gift! 100% SATISFACTION GUARANTEE or your money back - You can buy with confidence knowing we will do everything to ensure you are 100% satisfied with your new jewelry. A wedding ring from Landa Jewel for a lifetime moment presented in an elegant gift box. 40 quid for a fake diamond with no reviews! Looks expensive! No-name sellers purporting to sell "925 Sterling Silver", generally, aren't selling real Silver items. Most, if not all, Chinese sellers put fake 925 stamps on their jewellery to up the price/make it seem more desirable. If you do Google Image reverse search on many "925 Silver/Cubic Zirconia" jewellery, it turns up on Aliexpress for mere pennies versus ££s. Can't find this one, though. The "White Gold" version is here http://www.thelanda.com/index.php?route=product/product&product_id=55&search=2.0+CT+6-Prong+Solitaire+Simulated+Diamond+Engagement+Ring though I wouldn't fall over myself to purchase, personally. They use the same images as the above "925 Sterling Silver" Amazon link! Stock images instead of real-life images can be another bad sign. £40 for a (highly likely) fake silver ring from a brand new chinese seller.. no thanks!